You love the way your eyes look when wearing your fake eyelashes and would hate to go out without them. Finding a lash adhesive that works all day is sometimes hard to find, especially if you worry about the weather or an unexpected moment of tears. With Forever Young's She-Gloo Lash adhesive, you can worry a lot less. This adhesive is easy to apply, and it quickly dries clear. The best thing about this adhesive is that it is waterproof, so you don't have to worry about a thing. 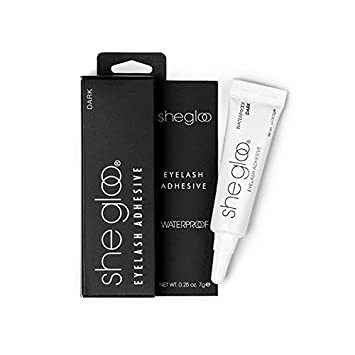 Before applying She Gloo Lash Adhesive , flex the strip lash band with your fingertips a few times to make the band looser and easier to conform to your eyelid. Unscrew glue cap to apply glue to the band of the lashes. Add extra glue on the ends of the lash band for extra hold. Wait 30 seconds for glue to become tacky. Center the lash close to the base of your natural lashes and press the ends into place along natural lash line. Gently peel each lash from the corner of each eye for to remove. Use oil-based makeup remover to remove lashes. Remove any excess adhesive with warm water. To use lashes again, remove any adhesive from the lash with warm water and keep lashes on the lash tray. Make sure to keep your Miss Adoro Adhesive AWAY from heat and direct sun light, and keep the cap on tight during storage.